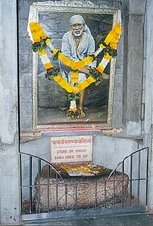 SatChitAnand Sadguru Shri SaiNath Maharaj Ki Jai ! Bow to Sadguru’s holy feet ! 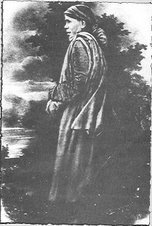 "Thus Brahman and Śakti are identical. If you accept the one, you must accept the other. It is like fire and its power to burn. If you see the fire, you must recognize its power to burn also. You cannot think of fire without its power to burn, nor can you think of the power to burn without fire. You cannot conceive of the sun's rays without the sun, nor can you conceive of the sun without its rays. "It is like water, called in different languages by different names, such as 'jal', 'pani', and so forth. There are three or four ghats on a lake. The Hindus, who drink water at one place, call it 'jal'. The Mussalmans at another place call it 'pani'. And the English at a third place call it 'water'. All three denote one and the same thing, the difference being in the name only. In the same way, some address the Reality as 'Allah', some as 'God', some as 'Brahman', some as 'Kāli', and others by such names as 'Rama', 'Jesus', 'Durga', 'Hari.' "
God and God’s shakti or power are one. One cannot exist without the other. I am normally greatly attracted towards Baba’s clothes. Just now wherever i read, the name Sai Baba or Sadguru, i get a vision of Sai ’s clothes emitting amazing graze and power. That is all i see and feel. Many a times while Meditating on Sai Baba picture or even casual loving look towards Baba’s picture the clothes of Sai seems to be emitting divine love and grace thus becoming a source of attraction. In nights, these days when the mind tries to go astray. 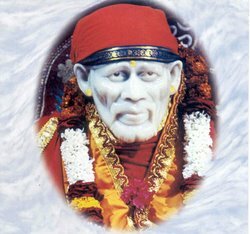 What i do is, i visit Shirdi mentally, maybe Samadhi Mandir, Dwarkamai or Gurusthan. Do pradakshina while chanting the name. Even the mental visits are so powerful, that it feels nearly the same as physical visits. 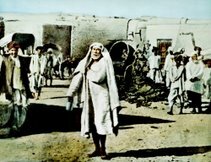 Yesterday mentally i was in MasjidMai and getting all attracted to Sai Baba’s clothes kissing the same, bowing to it and praying it as the source of infinite, the ParamAatma. Although these days the attraction is towards His chest, as i ask for the deep connection with His heart to my heart. The response is instant and it deepens on watching it for longer time, with mental chanting coming from the depth of my heart. Even during performing Sai Baba Arati. The mind is attracted to His chest area seeking deep connection with His heart to mine. Response from Baba is so good that my throat gets choked during the end of the Arati. I cannot even sing the aarti. It is sung only by the other family members while i watch His heart. In Shirdi Saibaba Sansthan, there is a museum where clothes of Sai Baba are placed. It’s worth a visit. Even there Sai ’s clothes have so much presence. 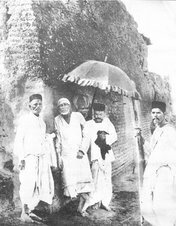 In a Gujarati book 'Sainath ne Sarane' an autobiography of a spiritual devotee of Shirdi Sai Baba, Shri Sai SharanAnand, at one place he writes his experience. 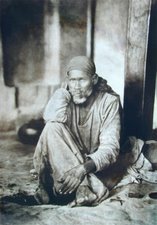 He was sitting in Shirdi and one devotee who was presented with Sai Baba’s attire by Baba himself, had hung the clothes to dry after the wash. Swami SharanAnand has written, he heard Sai Baba’s words, “Why am I hung here?” repeatedly for few times. Swami Sharanand further writes that Sai Baba’s voice clearly came from the clothes. 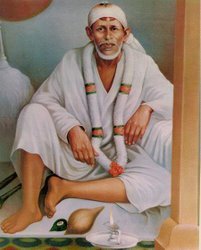 Many of us feel the presence of Baba while chanting Sai Baba’s name or mantra, or while reading Shri Sai SatCharitra and while being in His temple. Sai's presence is everywhere. Sai’s presence and Sai are the same. Even when we get clothes consecrated at Samadhi Temple or Dwarkamai, they carry the divine presence of Shri Sai. Hanging on to the relative we have to reach the absolute. The SatChitAnand. The divine truth consciousness and bliss. 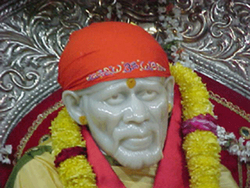 Love towards Sai Baba’s picture or articles with His divine presence takes us deep within us. 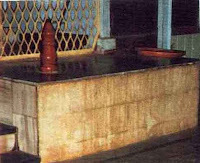 That is where the source SatChitAnand is. The infinite absolute bliss. That is Baba says should be our goal. The goal we cannot reach. We have to seek the Sadguru’s love and grace, which can make us melt and merge in the infinite absolute bliss. Today i received a Sai Baba story through sms. Ramchandra Sitaram Dev once prayed to Baba that, Sai Baba should be his Guru. Baba replied, “It is not necessary that we make someone Guru. Everything is within us. What we sow we reap. What you give that comes to you in return. There is no need for Guru! Everything is in you. Try to listen to the voice of the inner soul, and whatever guidance you get, follow it. We have to look at our own self. That is the Guru." I replied to the sms, that i was doing exactly the same, and Sai Baba attracted me and told me that Guru’s love and grace is most important see my first experiences with Sai Baba. Only Baba knows his leela. Chant from the depth of heart and being, the holy name Sai Baba and feel the difference in your consciousness. Seek His divine love and grace because nothing is greater than that. Love encompasses all. Whatever is needed is taken care of. Om Sadguru Sainathaya Namaha ! Sai BABA's defination of GURU..
“It is not necessary that we make someone Guru. Everything is within us. What we sow we reap. What you give that comes to you in return. There is no need for Guru! Everything is in you. Try to listen to the voice of the inner soul, and whatever guidance you get, follow it. We have to look at our own self. That is the Guru. What a simple way of teaching.